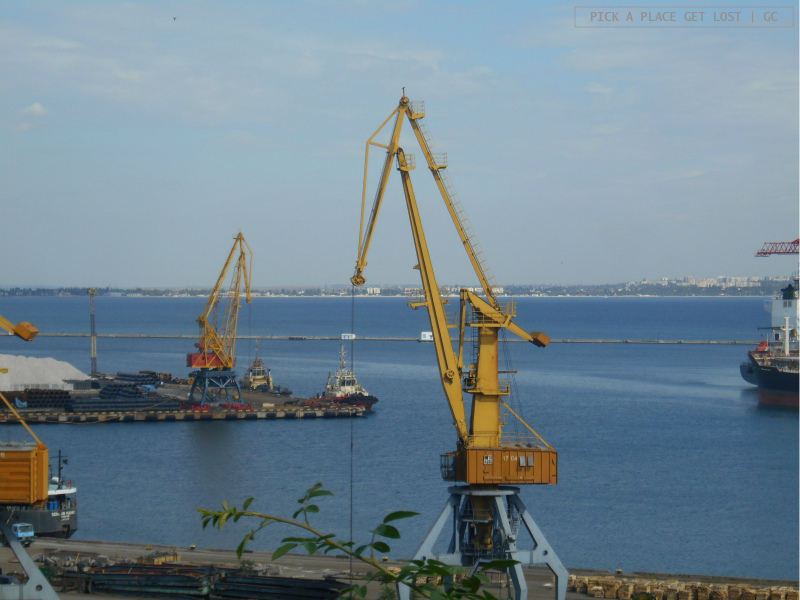 Going to Odessa from Kiev is like moving from one place to its (almost) exact opposite – and not only because Odessa is located by the sea, while Kiev is not. Traffic in Odessa city centre is not even remotely as heavy as it is on average in Kiev, and the fact that Odessa has ‘only’ around one million inhabitants (against around three times as many in Kiev) also plays a role. As we stepped off the night bus at Odessa bus station (conveniently situated right next to the train station) around five in the morning, and we saw… nothing. 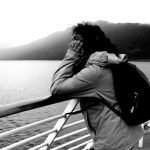 It was still pitch black, the area around the station felt like the most nondescript place on Earth, and we found ourselves instantly and utterly freezing. So yes, the welcome from the city was not the warmest, but the two whole days we spent there did make up for the cold greeting in every possible way. I’ve gone through my Odessa photos multiple times since then, and I’ve realised that there are a few recurrent things that keep drawing my attention and take me back there every time I see them. 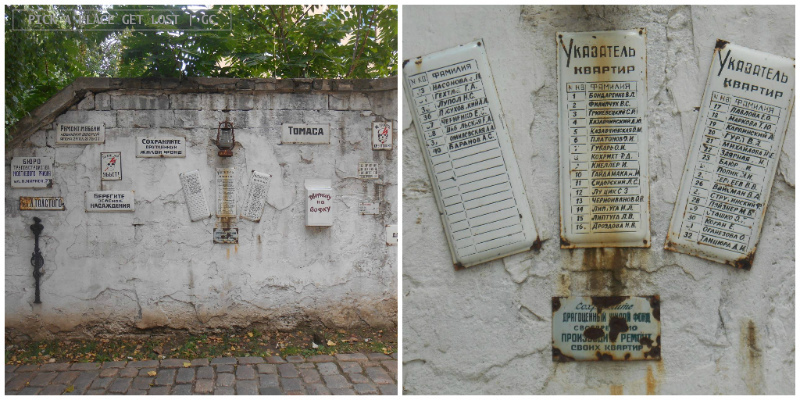 These, to me, are also the things that make Odessa special in its own way. I mean, Odessa must also be special for a lot of other reasons, which I probably can’t afford to point out due to the very little time I had to tour the city. I’ve made a list of ten good points, though. Here they are. If I had to pick an adjective to describe the centre of Odessa, it would probably be ‘charming’. No wonder the city is packed with tourists, mostly attracted (especially in the summer) by its favourable weather, characteristic yet cosmopolitan identity, and sandy beaches. 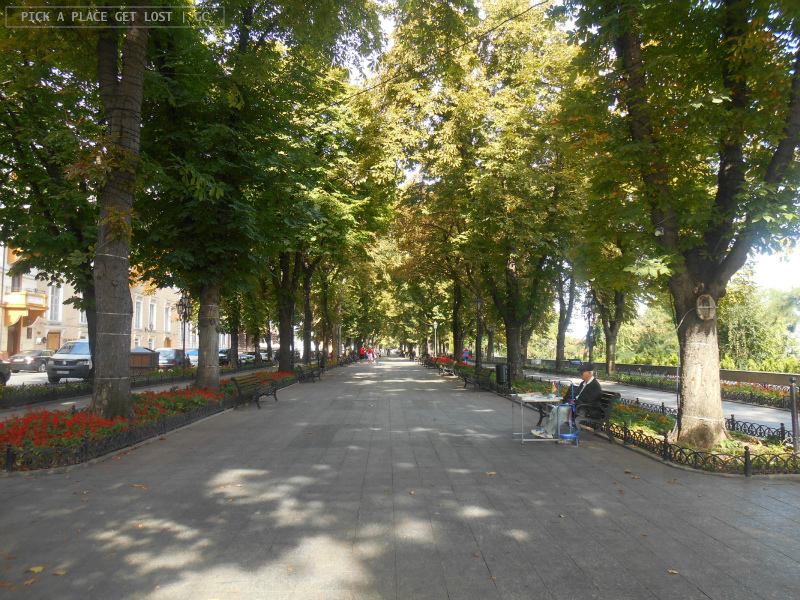 The main street, Derybasivska (Дерібасiвська), is a pedestrian promenade flanked by bars and restaurants and seemingly designed to encourage endless strolls up and down its leafy pavements. Toward the western end of the street you will find the City Garden, a large, airy square framed by trees, more bars and cafes, and a few bronze statues there and there. The most popular is probably the chair. Yes, it’s an empty chair, so it might not say much to you when you see it. If you’re kind of familiar with literature from the Soviet period, though, you will know it’s a reference to The Twelve Chairs (Двенадцать стульев), a super famous satirical novel by Odessa-born authors Ilf and Petrov. 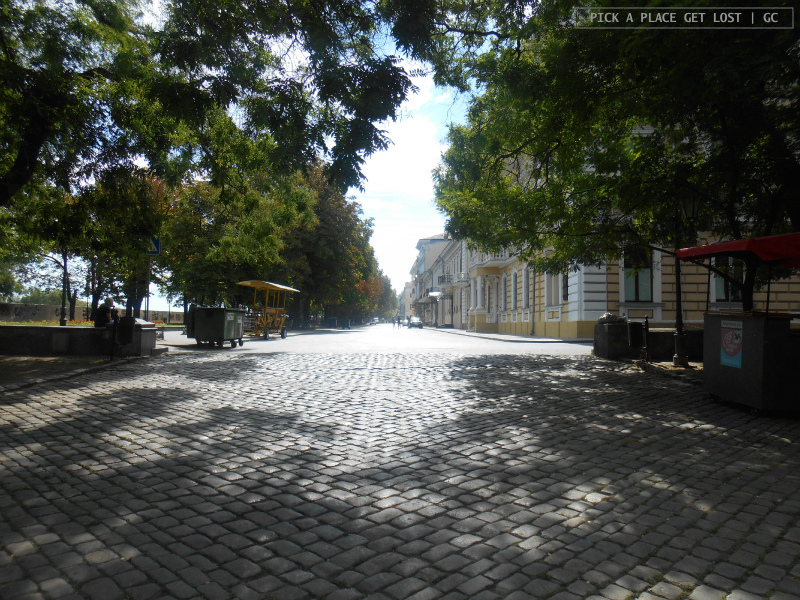 The ample square at the end of Derybasivska toward the City Garden is the Cathedral Square, while the opposite end of the street is marked by a statue of De Ribas, the Spanish-born officer that found the city of Odessa and built its harbour. 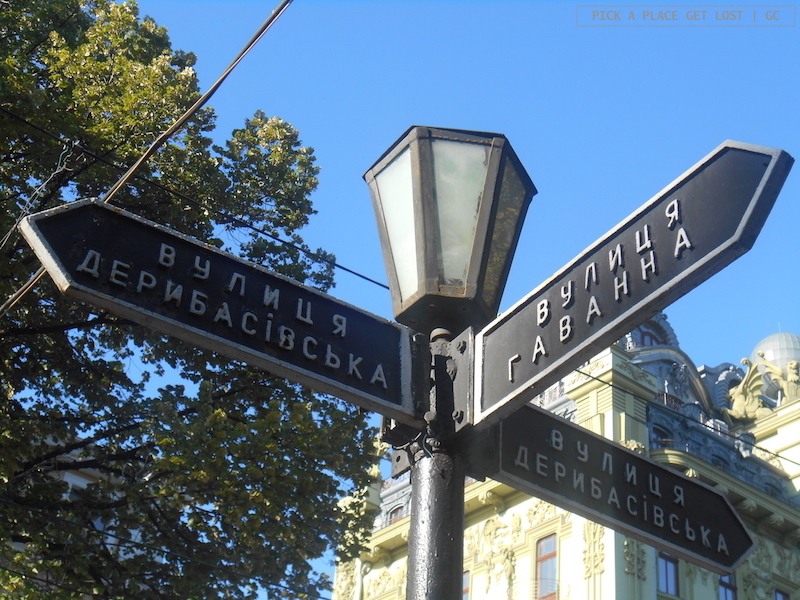 Derybasivska Street itself is named after him. Compared to the very heart of the historical centre, its immediate surroundings already seem to display a slightly less colourful, less polished appearance. The shops are less fancy, and populated with locals more than tourists, the pavements are cracked and dirtier on average. The closer you get to the station, the more the urban landscape has a kind of ‘worn out’ feel to it, which I personally find super authentic, and therefore also fascinating. If you walk down Panteleymonivska Street (one of the streets that run close to the station) you might notice a bunch of silver domes stand out in the rows of city blocks. That’s Panteleymonivska Church, an Orthodox church founded by Greek monks borrowing stone from Costantinople. According to the legend, the frescoes on the façade were repeatedly whitewashed by the Soviets, but kept resurfacing every time they covered them. Recent restorations also gave it a hand, so you might want to go and see for yourselves what they look like. Primorsky Boulevard (Приморський бульвар) is the tree-flanked street that runs parallel to the sea. It’s also one of my favourite Odessa spots. You can easily reach it by walking to the top of Derybasivska (the end with the statue of De Ribas) and turning left at the roundabout. 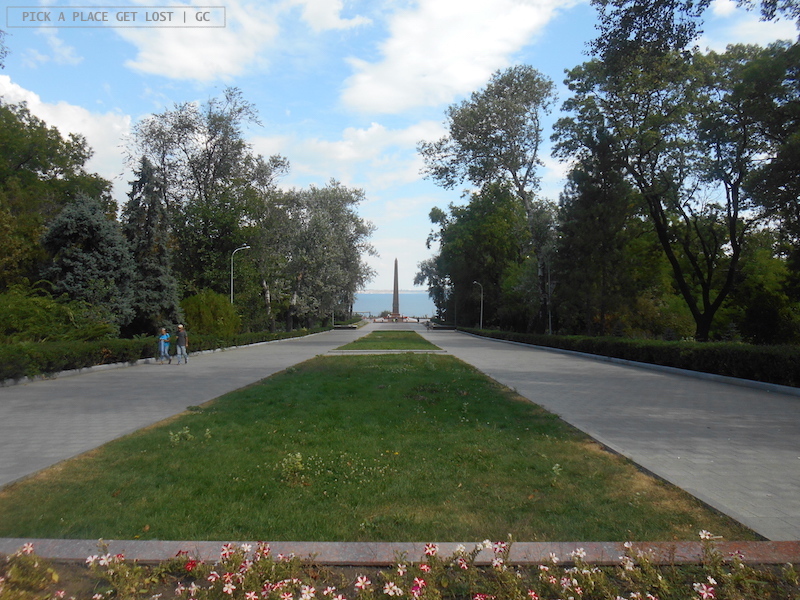 The boulevard is marked at its ends by the City Hall and Vorontsov Palace (see entry no. 4). One side of the street is lined up by a row of elegant, majestic buildings, while the other offers a sweeping view of the sea and the port. Walking down Primorsky Boulevard is like stepping back in time. The street lamps replicate samples from the 19th century, thus contributing to the overall picturesque appearance of the street. Remains of Greek settlements from the 4th and 5th centuries B.C. were discovered in the area, and are still visible through glass cases specially placed here and there along the street. Music played by the (more or less) occasional busker adds to the picture. 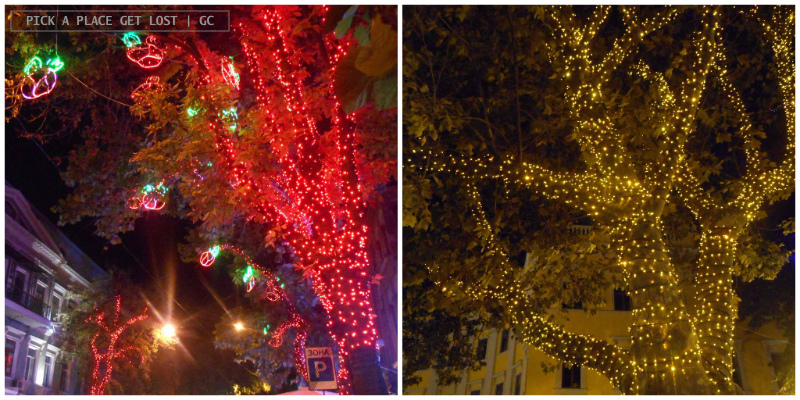 And at night the boulevard (as well as Derybasivska) lights up in an explosion of multi-coloured tiny lights tied around the trees. So beautiful! 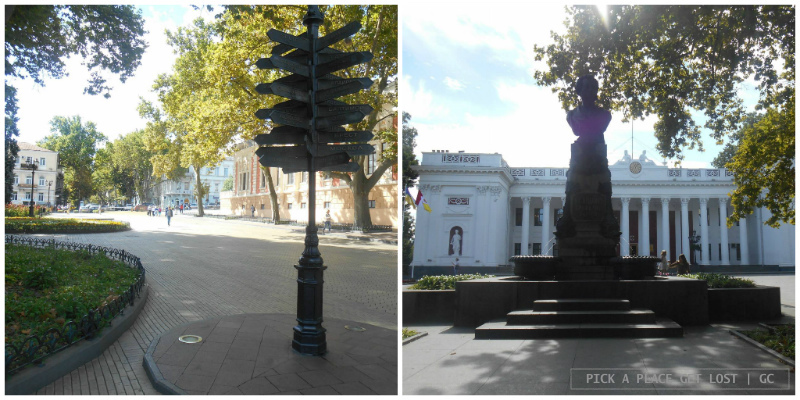 Notable sights on the boulevard also include the cannon outside the City Hall (stolen from the British in 1854 during the Crimean War), a statue of Pushkin (who lived in Odessa for around a year), also not far from the City Hall, and a statue of Duc de Richelieu, Odessa’s first governor, dressed in a Roman toga. Though you don’t know who Mr. Potemkin is, chances are you’ve heard the name anyway, likely as part of some reference to the battleship by the same name. Battleship Potemkin is an uber famous 1925 Soviet silent film directed by Sergei Eisenstein. It tells the (dramatised) story of the mutiny of the crew of the Russian battleship Potemkin, who rebelled against their officers. 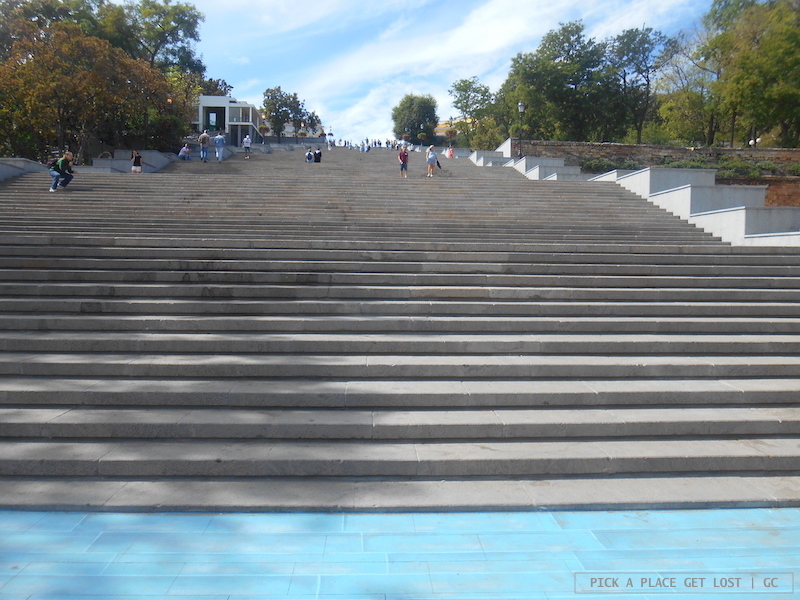 The steps, previously known as Primorsky Steps, were renamed Potemkin Steps in 1955 to commemorate the 50th anniversary of the mutiny. After Ukraine became independent, the old name was reinstated, but the label ‘Potemkin Steps’ is still the most common to refer to the monument. 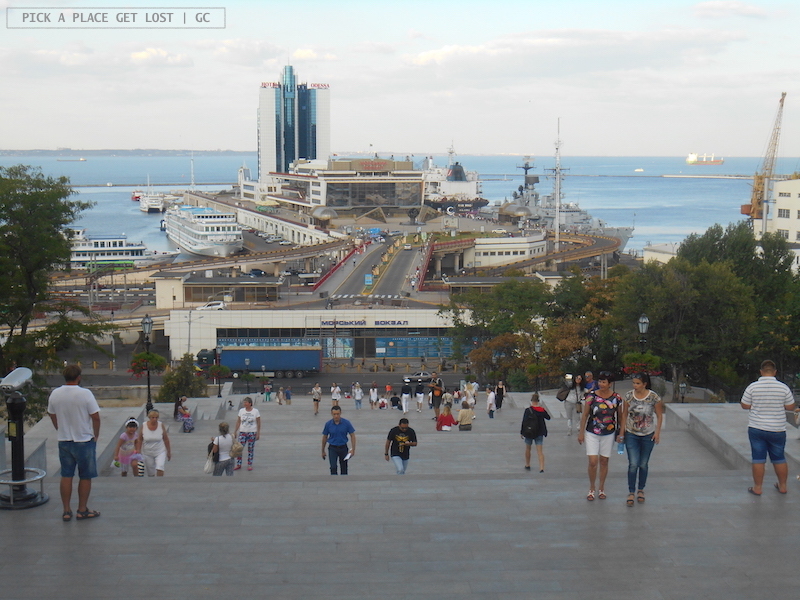 The giant, broad stairway leads down from Primorsky Boulevard to the sea port. It was designed and built so as to create an optical illusion: if you look up at the steps from the bottom, you do not see the landings between the flights of stairs, while if you look down at them from the top, all you see are the landings. It works, see for yourself! The stairway is probably Odessa’s most popular monument, and it’s objectively beautiful. Walking up and down the steps is one of those things you will want and have to do if you want to see and make the most of it. 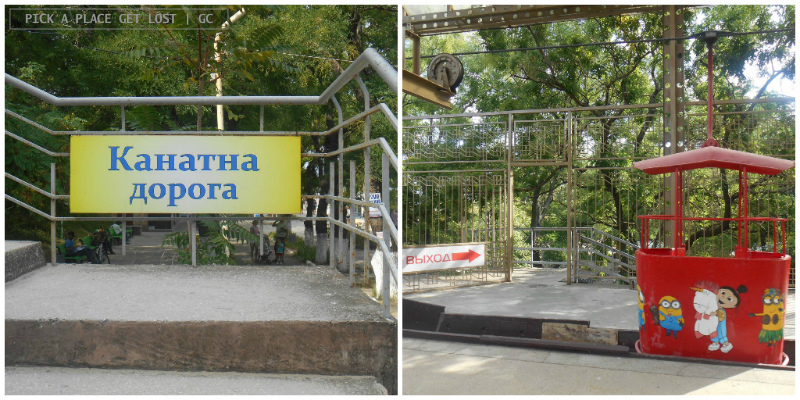 To go back to the top without climbing the stairs there’s also a funicular running parallel to the stairs. Bu so who was Mr. Potemkin then? Well, Gregory Potemkin was a Russian general, and Catherine the Great’s lover. His career included many extraordinary accomplishments, plus he supervised the construction of a number of historical buildings. The famous battleship was named after him in 1891, once century after his death. Architectural diversity is a highly recurrent feature when it comes to middle-sized, let alone large cities. Odessa is certainly no exception. 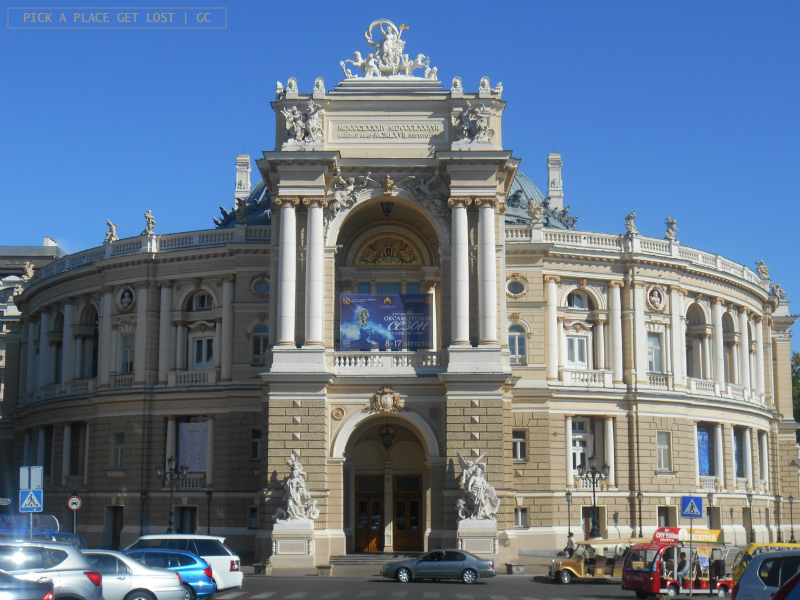 The architectural landscape is characterised by a multitude of styles, amongst which two were especially popular when Odessa saw its cityscape deeply renovated throughout the 19th century: Neoclassical and Neo-Renaissance. – the Opera and Ballet Theatre, inspired by Dresden’s Semperoper, but designed by the same architects that designed the State Opera in Vienna, and built in late Baroque style. – the Passazh, a covered shopping arcade located across the street from the City Garden. The hall, built in Neo-Renaissance style, will strike you for its airy space and the rich, articulate decoration of the interior walls. – the neoclassical Potocki Palace, now home to Odessa Art Museum. It is worth mentioning that the majority of the buildings listed here were designed by the same author, Italian architect Francesco Boffo. Boffo, who also designed the Potemkin Steps, was Odessa’s main architect in the first half of the 19th century, and played a truly pivotal role in the sweeping renovation of Odessa cityscape in those years. 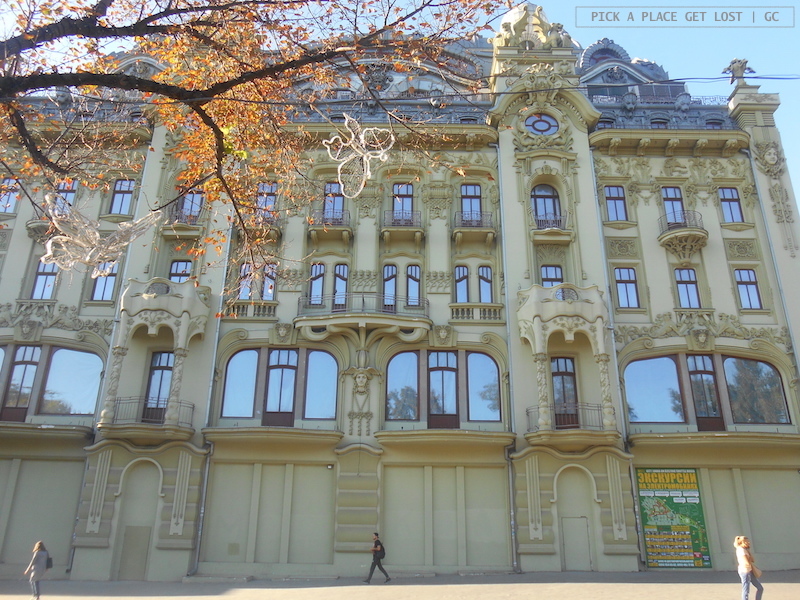 As you walk the streets of Odessa, you’re likely to come across many other lesser known, equally beautiful buildings. I did, and, although I couldn’t put a name on any of them, I also couldn’t help wondering about their history. Some were massive and imposing, others were sumptuous and elegant, others still were in a state of abandonment, but still bore traces of their past glory on them. 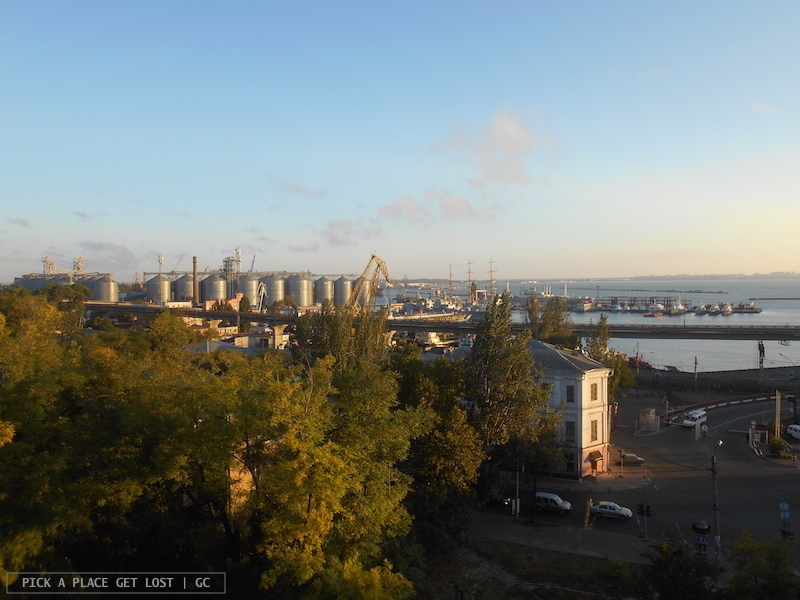 One of the reasons I liked Odessa is that it’s a port city. I love port cities. In particular, I love how ports add this extra ‘maritime’ level to the urban identity of the city itself. 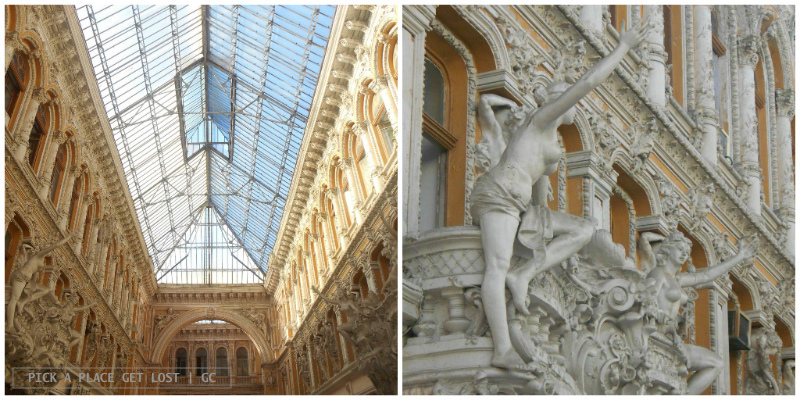 The cosmopolitan vibe that identifies Odessa is rooted in the history of the city. In 1815, soon after it was founded in the late 18th century, the city became a free port. This also made it a crucial transport hub, as well as a crossroads between the East and the West. 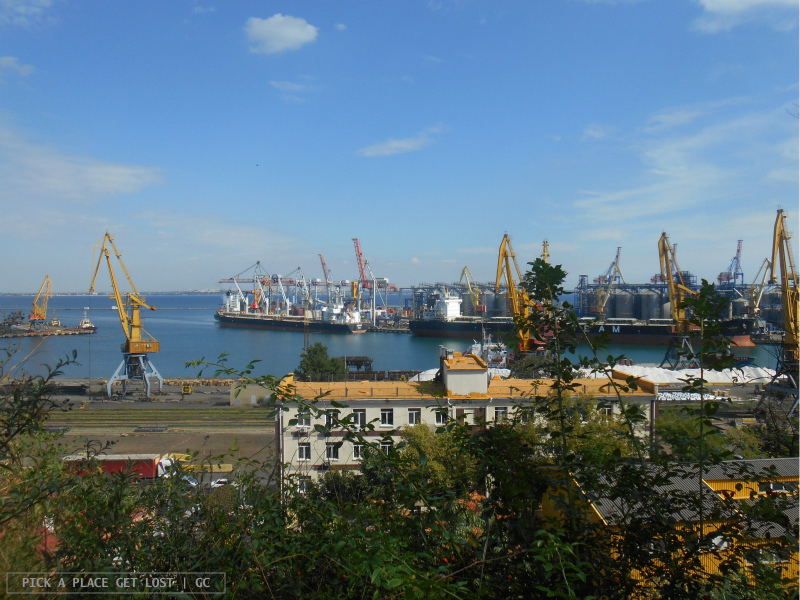 Today Odessa is the main commercial port in the country. It plays a primary role in the Black Sea basin, and not only. The hustle-and-bustle of the port (used for both cargo and passenger transport) still contributes to the lively, vibrant atmosphere that characterises the city. 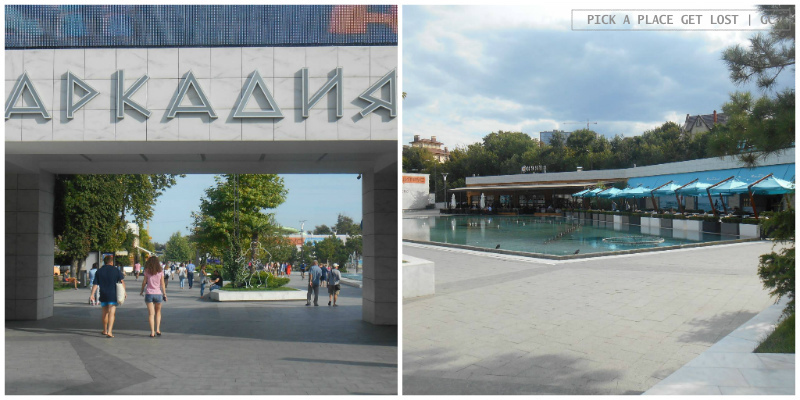 It also forms an integral part of Odessa’s already unique urban landscape as a whole. 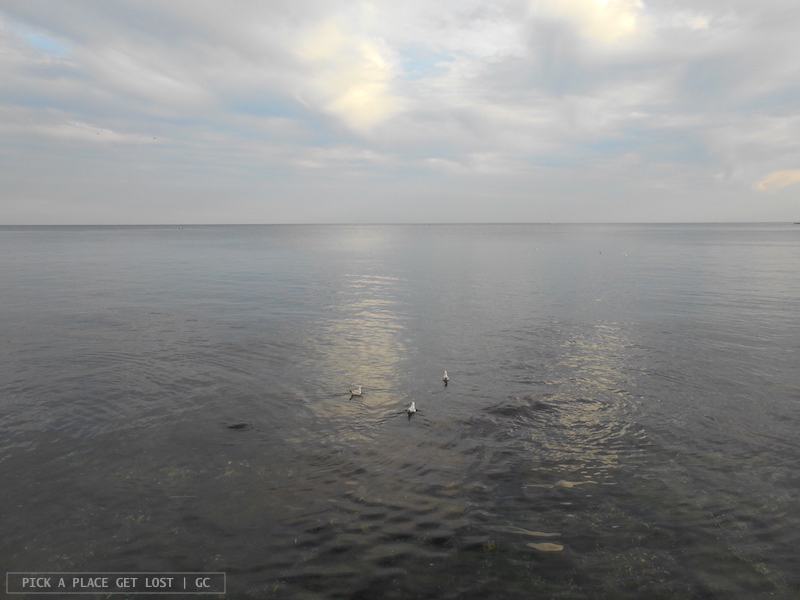 The Black Sea is one of those things that make you reconsider the concept of Impressionism. One of the things you learn at school when you study Impressionism is that Impressionist painters often spent long hours outdoors, watching the landscape while at the same time painting it. They paid particular attention to the light, its momentary nature, and the effects of sunlight on the subject portrayed. 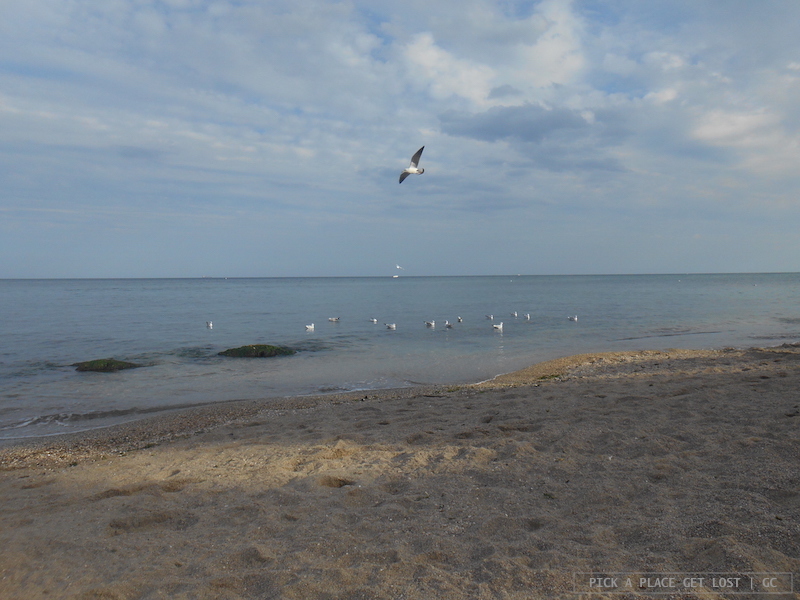 The Black Sea made me want to be an Impressionist painter. If I’d had a canvas, a brush and a palette of colours back in the 1870s, I could have spent hours on end by the Black Sea, trying to capture as many shades of blue as the flat surface of the sea could present me with. And yet, I would have missed out on so many of them, the light changing too quickly for you to keep up. So, when you go to the Black Sea feel free to bring along your canvas, palette and brush if you have them – or else, your camera will do. But most importantly, make sure you look at the beauty of the sea as it is: now turquoise and opaque, when hit by the sun off the coast, now clear and transparent by the shore, now dark and shiny like raw obsidian. A lot more than just fifty shades of blue. Because we all know that ‘sea’ rhymes with ‘beaches’, and while you’re out to see the former, you’re often also visiting the latter. 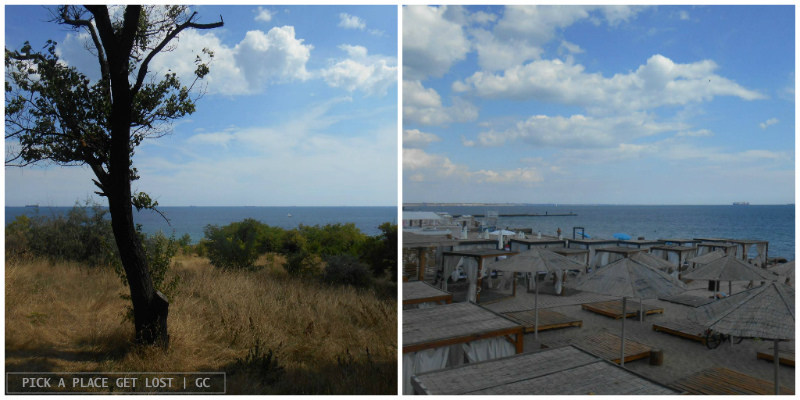 While in Odessa, we went to the seaside twice. We picked different beaches, as we wanted to see at least a couple of them. Of course, there are many more to go to, if one has more time to stick around. 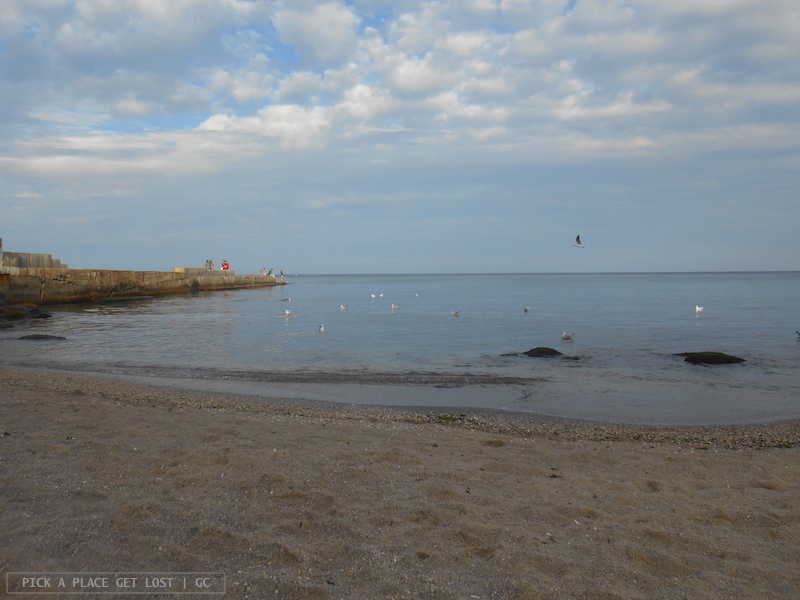 It was not the case for us, so we opted for two quite popular beaches fairly close to the city centre. The first is Arcadia Beach, probably Odessa’s most famous beach, equally popular for the beach itself and for its lively night scene. It can easily be reached by public transport, i.e. by taking tram no. 5 from Panteleymonivska Street (near the Mc Donald’s outside the train station, Zaliznychnyi vokzal stop), and get off at the final stop. 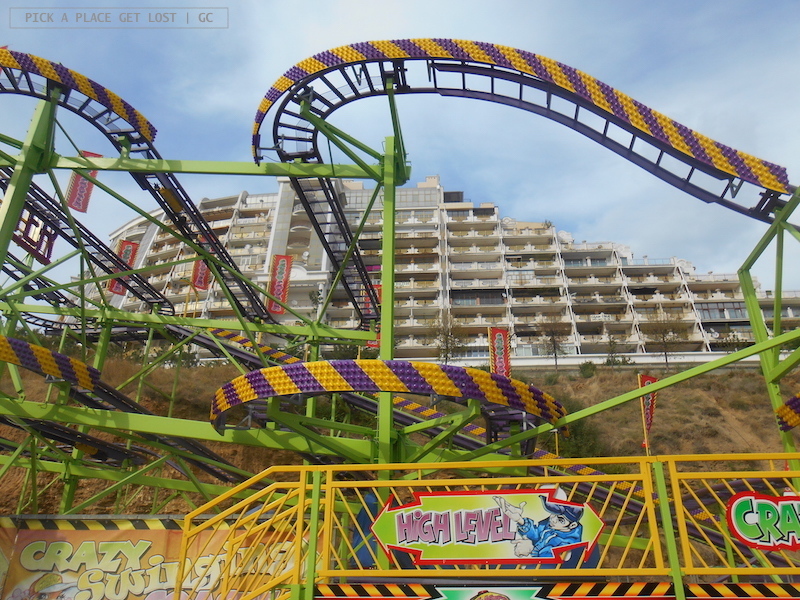 If you head there in the high season and/or at the weekend, though, be prepared for a highly uncomfortable ride in a tram packed with beachgoers of all ages. It takes a while to get to the actual beach from the tram stop. First, you have to walk through Arcadia City, an outdoor shopping area which consists mostly of trendy bars, restaurants and cafes. At that point, if you go straight you will see Ibiza beach in front of you. If you’re looking for a quieter spot, ignore it and turn left instead: if you keep to the main road you will come across more shops, restaurants and bars. Some of the latter also have access to private beach fronts equipped with umbrellas and sunbeds – which if you want to enjoy you will have to pay for an admission fee. Or you can just keep going till the crowds gradually thin out, and you see a concrete slab jutting out of the shore. That is where the free beach is. If you wait till late afternoon/early evening, you will be left with more seagulls than people around, while the sea wearily crashes against the shore and the sun disappears behind the buildings in the distance. The urban landscape is made even more interesting by the old mansions and sanatoriums scattered near the beachfront. Populated by wealthy Odessites in the old days, they now evoke a once-popular (and once-mandatory) notion of hospitality and treatment, and their pale colours strike a subtle, yet marked contrast with the average brightness of modern shop signs and attractions in the area. 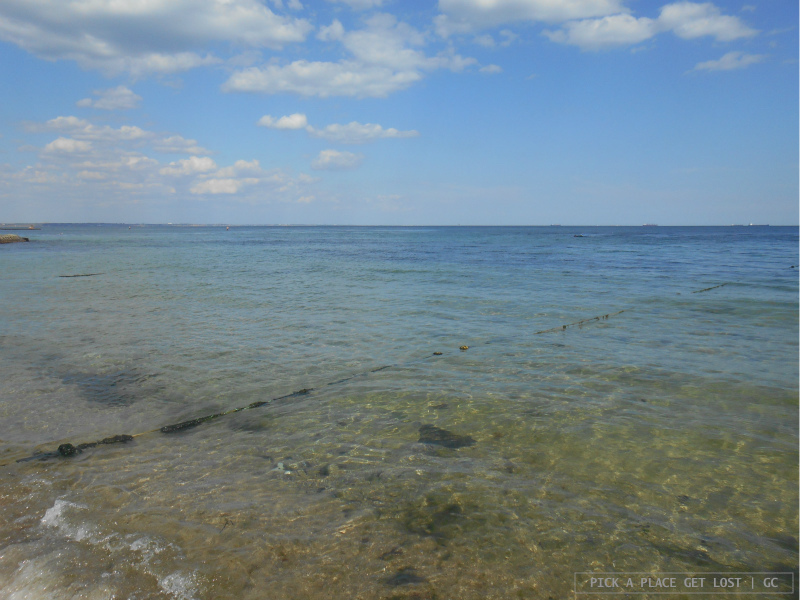 As I’ve already mentioned, Odessa has its fair share of beaches, so when it comes to picking one or two in particular, you’re really spoilt for choice. The day after Arcadia, we went to Otrada Beach first thing in the morning. By the time we got there it was no longer that early, as we got there on foot and visited Shevchenko Park along the way (see entry 9). The beach was fairly quiet and not too crowded, the sea transparent and turquoise in the distance. We came across a restaurant with a sea view as we strolled down the beach, so lunch also happened, and it was lovely. But there’s something that makes Otrada more unique than other Odessa beaches. Yes, because, while you can easily go to and from the beach on foot or by public transport, you can also get there by chairlift (канатна дорога). Yes, chairlift. We only took it to go back to Odessa from the beach, and it was amazing! The chairlift access is located right by the shore. 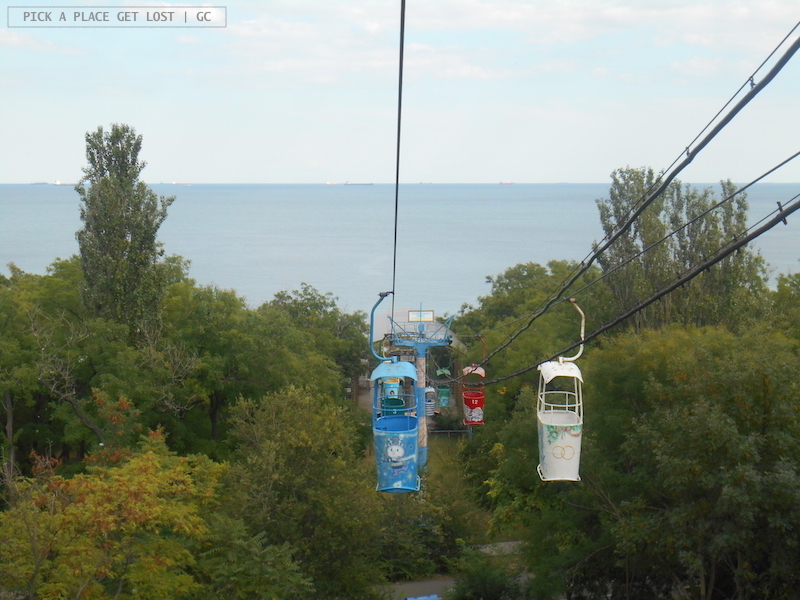 Pay a few hryvnya, hop onto one of the colourful cabins that tirelessly slide along the cable, and enjoy the ride! The view is superb, what with the sea in the distance and a(nother) sea of trees below. There is silence all around, but for the creaking, repetitive sound of the cabin travelling uphill. The chairlift will drop you off at the beginning of a rather nondescript street. Right there and then we were a bit lost, as we had no clue where exactly we were. With hindsight, it’s easy. Walk till the end of the street, underneath the yellow arch (called Mauritanian Arch), and turn right into Frantsuzky Boulevard. That’s the street where the tram goes, so you can either hop on tram no. 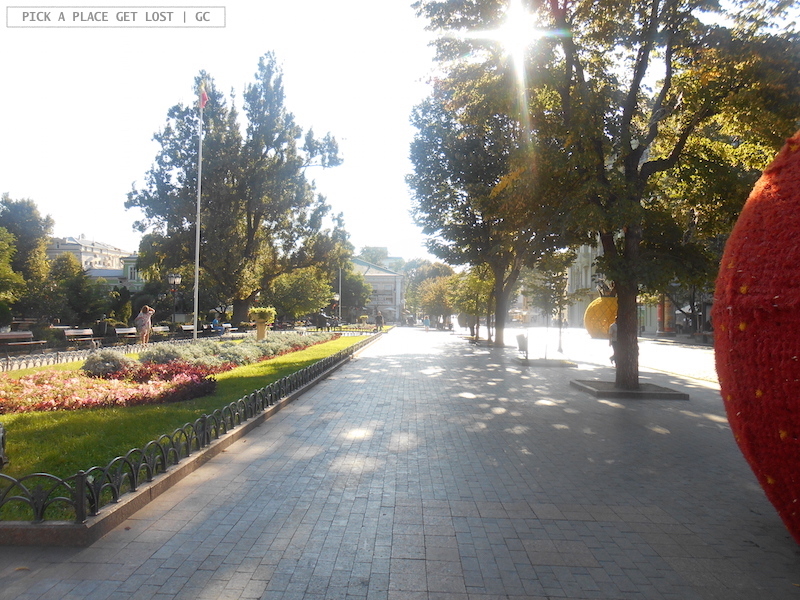 5 to Panteleymonivska Street or go back to the centre on foot. 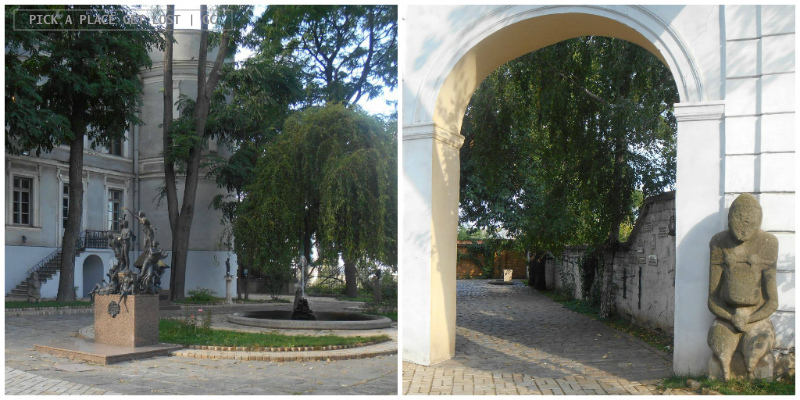 I can think of at least two parks that provide an exceptional insight into Odessa’s history, culture and art. 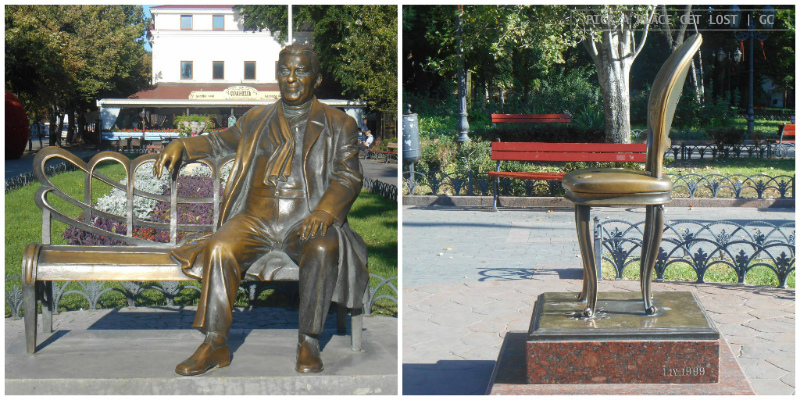 One is Shevchenko Park. Remember when, on the subject of Kiev, I mentioned that Taras Shevchenko is a key figure when it comes to all things Ukrainian? Well, again, Odessa is no exception. The park lies west of the city centre and north of Otrada, very close to Lanzheron beach. 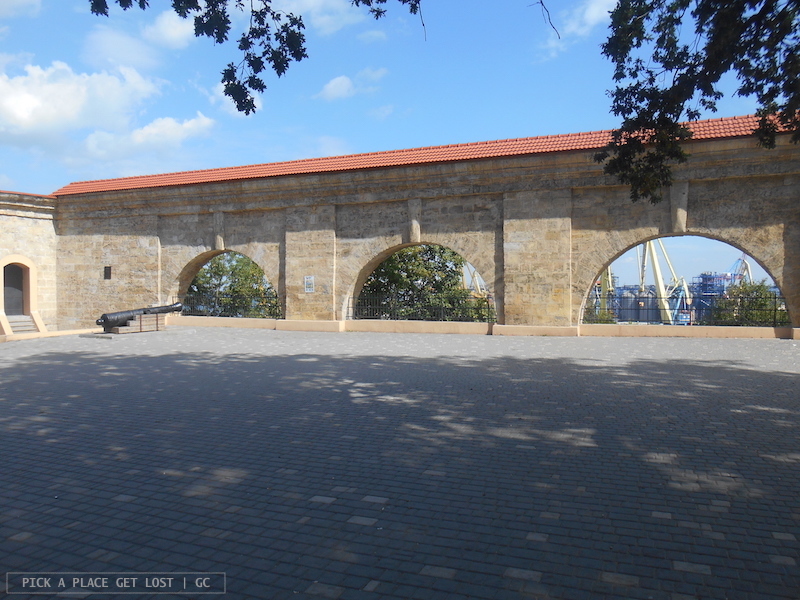 It was officially opened in 1875 on a site that had been part of Odessa fortifications. After the Russo-Turkish War (1811), the fortifications were turned into a quarantine area, which in turn became a garden in 1840. Incidentally, the garden project was designed by Odessa’s super favourite architect, the one and only Francesco Boffo (see entry no. 4). – the Monument to the Unknown Sailor, which is situated at the end of the Alley of Glory right next to the arches, and offers a stunning view of the port. 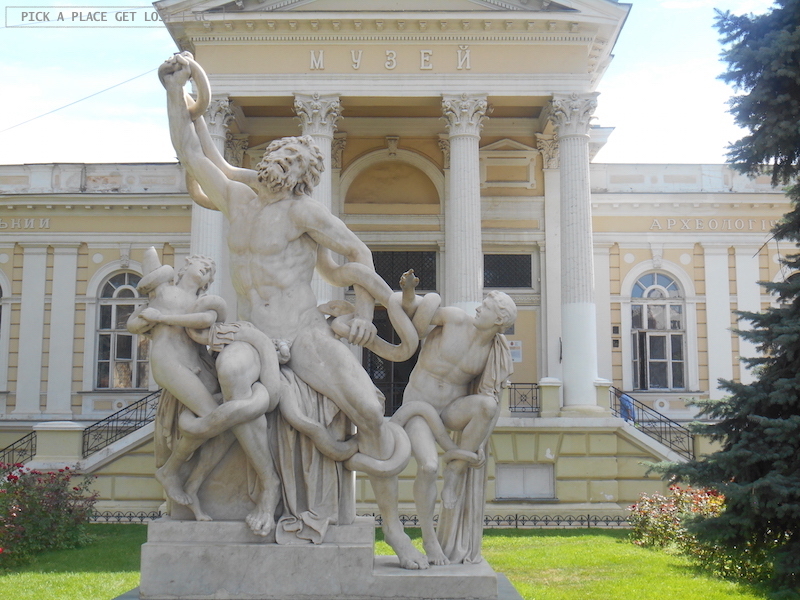 The other park I would recommend visiting is the Garden of Sculptures (Сад скульптур). Technically it is the garden of the adjacent Literary Museum, but at the museum ticket counter you can also buy a special ticket only for the garden. 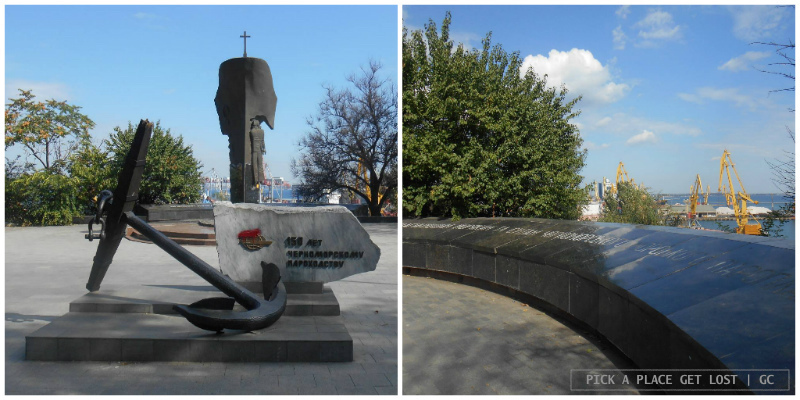 The garden is a tribute to Odessa’s most popular citizens and most iconic fictional characters. It’s a one-of-a-kind museum, and touring the open-air gallery is like exploring bits of history, culture and literature of the city. Needless to say, there’s also a sculpture of authors Ilf and Petrov dressed in Roman togas. Like I could not include a food-related entry. 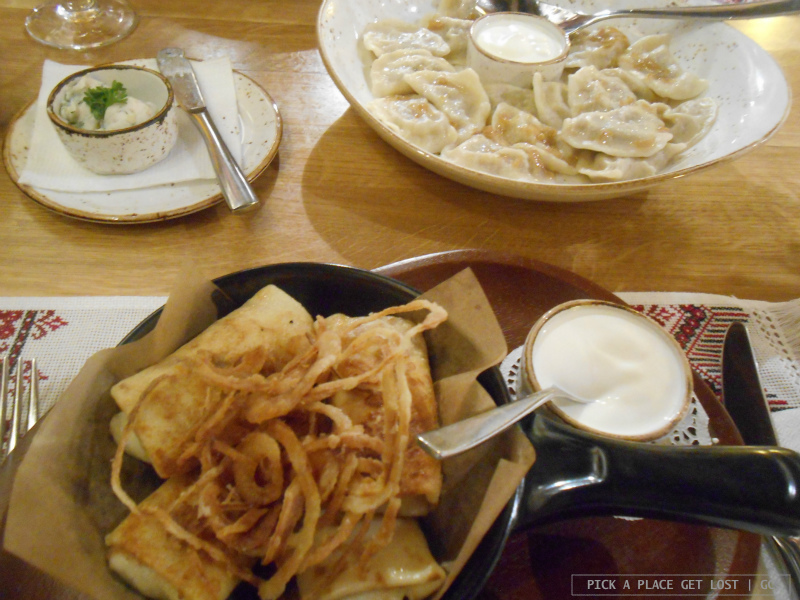 Ukrainian food and Russian food have a lot in common. 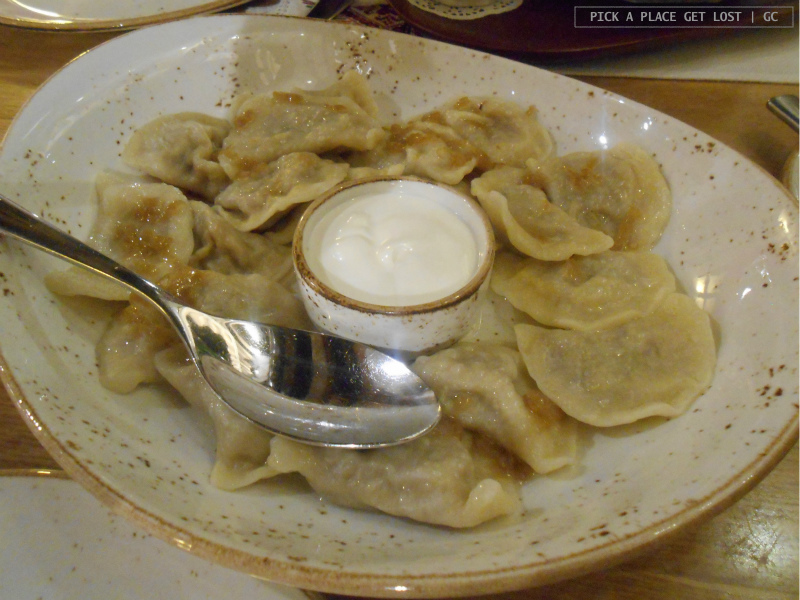 From dumplings like pelmeny (пельмени) and varenyky (вареники) to soups like borsch (борщ), some of the staples of Ukrainian cuisine objectively coincide with their Russian counterparts. With regard to Odessa, I had great food experiences. I can quite confidently recommend two places in particular: Farsh (Фарш) and Kumanets (Куманець). If you’re looking for a Burger Place To Remember, search no more: Farsh (Фарш) is the place for you. Located in the heart of the city centre (on Katerynynska Street), it’s specialised in burgers and meat, but no worries: even if you’re a vegetarian, you won’t leave on an empty stomach! The interiors are informal (and a little, but not too hipsterish), but if the weather permits, you can sit at one of the tables outside, and bask in the summer sun, while sipping a cold beer. Also, the food is great! As for Kumanets (Куманець), it would take me a while to explain in great detail why it should definitely be on your Odessa to-do list. To give you the short version, the place is a combination of the following: yummy, hearty traditional cuisine, a warm atmosphere, and bright, welcoming interiors where the wood of the furniture meets the bright colours of the table settings and the traditional costumes of the staff. Final bit of advice: you might want to book in advance, even more so if you’re a large group and/or wish to try it at the weekend. Odessa has more to offer than the bunch of entries I’ve mentioned in this post. Whether you see everything in the city or are able to enjoy only a small portion of its sights, though, there’s one thing that will strike you regardless, and that’s the unique vibe that lingers in the Odessa air. Its energetic, decadent, cosmopolitan, maritime, and contradictory atmosphere is objectively palpable. You just have to let it get you, and it will. 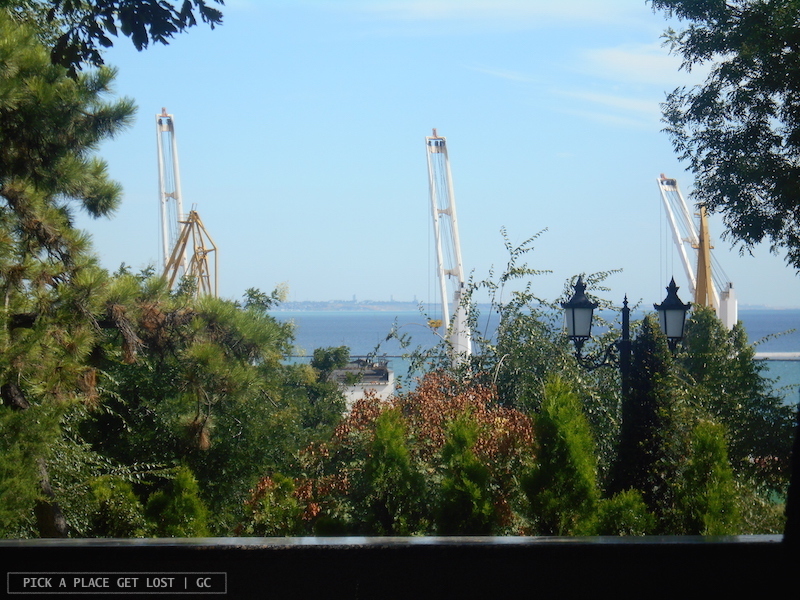 This entry was posted in Ukraine, Ukraine 2017 and tagged black sea, odessa, ukraine, ukraine tour by Giorgia. Bookmark the permalink.